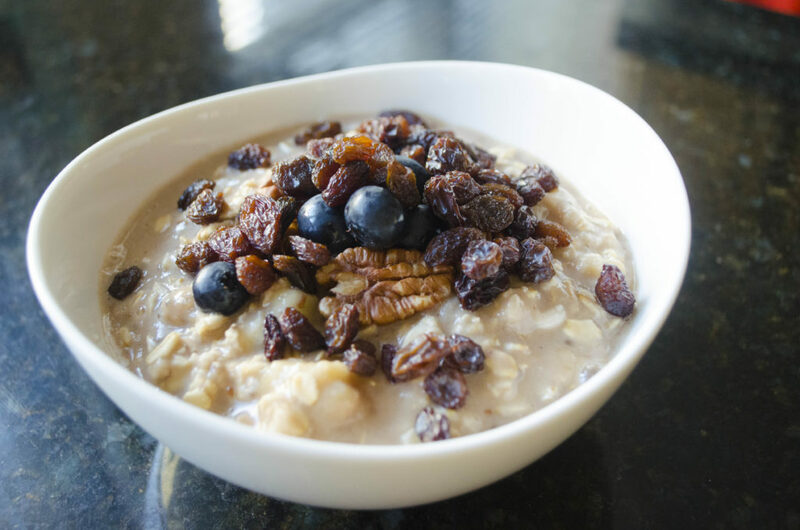 This is the best plant-based banana oatmeal recipe you will ever try. Not only is it packed with clean ingredients, but it is also super tasty and simple to prepare. It is loaded with healthy chia seeds, flaxseed, fruits, and nuts. These nutritious ingredients will keep you satisfied until lunch time. A ripe mashed banana adds an all-natural sweetness to the oatmeal. Chia seeds add a pudding-like consistency. The chia seeds also give you desired fiber and protein. Flaxseed gives you those Omega-3’s. If you like things extra sweet, then use an extra-ripe banana. This will keep the oatmeal clean and free of sugars. You can also add a dash of cinnamon to make your perfect breakfast on a crisp autumn morning. Let’s talk about the cooking technique for a moment. Microwaving the oatmeal in two 2 minute intervals gives it the best consistency. No sticky mess or soupy oatmeal. This recipe makes 2 huge servings. Great news since breakfast should be the biggest meal of your day 🙂 You can also say goodbye to those pesky mid-morning munchies. This recipe takes less than 15 minutes to prepare – Yes, it is that easy! 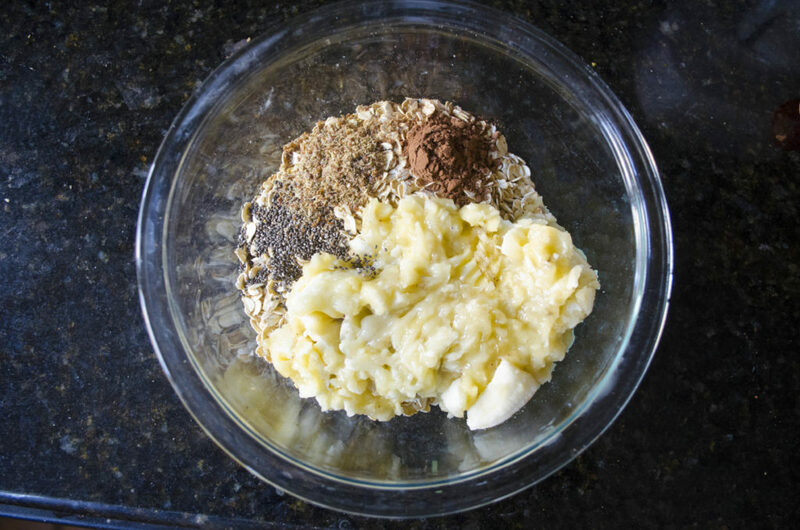 Combine the oatmeal, mashed bananas, ground flaxseed, chia seeds, cacao powder, and 1 cup of milk in a medium sized bowl. Stir well to combine all ingredients. Place in microwave (on high) for 2 minutes. Add the rest of the almond milk and stir well to combine. Place in microwave for another 2 minutes. 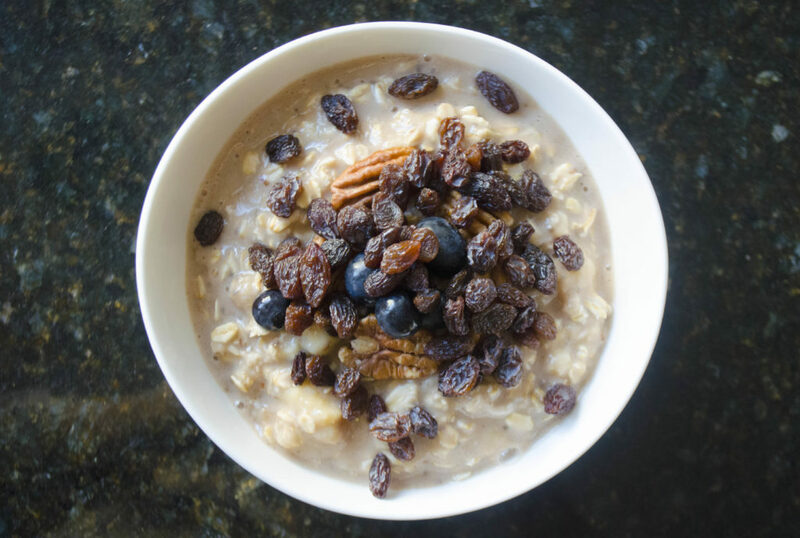 Separate oatmeal into two bowls and top with blueberries, pecans and raisins.